While Earth’s official Moon is busy photobombing us, a bunch of smaller upstarts are vying to become Moon #2. That’s right — Earth may have a rotating entourage of ‘mini moons’, and astronomers are determined to find them. The ‘one mini moon’ Jedicke is referring to is roughly 3 meters in size. It was discovered in 2006 and orbited the Earth for about a year before escaping our planet’s gravity. Three meters may not sound big enough to warrant any sort of moon status — after all, we’ve got hunks of orbiting space trash that aren’t much smaller. But I’m not at liberty to make such weighty decisions, now, am I? Typically no larger than a washing machine, mini moons are temporarily caught by Earth’s gravity. 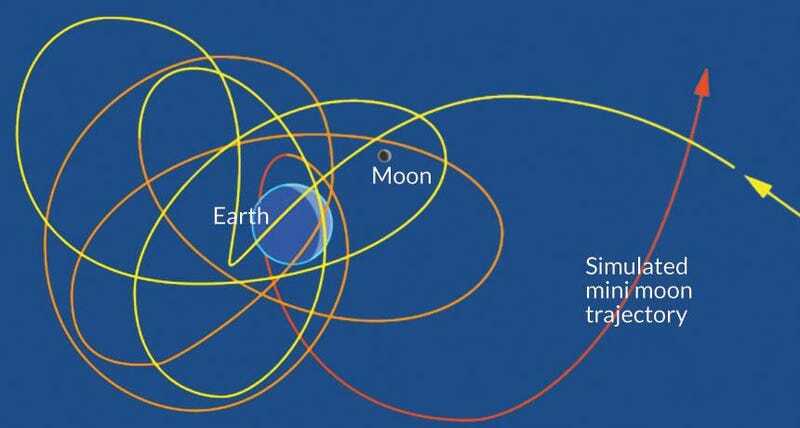 Beach ball-sized mini moons buzz around Earth by the dozen, like a swarm of interplanetary gnats, while dump truck-sized asteroids swing by once every 50 years or so. These moon wannabes are so small it’s going to take a lot of telescope time for astronomers to spot them. Jedicke’s hopeful he’ll turn a few up next year, using the Subaru Telescope in Hawaii. Very large telescopes expected to come online within the next decade could also aid in the search. Besides having a cute name, why do these Earth-orbiting mosquitos matter? They could make good targets to pilot-test asteroid mining equipment, for one. Or any other sort of small landers and/or space probes humans dream up. The sky’s the limit — or rather, the edge of Earth’s gravitational field is.